I do hate steam launches: I suppose every rowing man does. I never see a steam launch but I feel I should like to lure it to a lonely part of the river, and there, in the silence and the solitude, strangle it. It may seem illogical for someone in software development, but there’s little I enjoy more than taking one of my projects out back and shooting it. It’s like that magic, fleeting instant between cutting the water off on the shower and stepping out onto the cold, cat-fur encrusted bath mat. 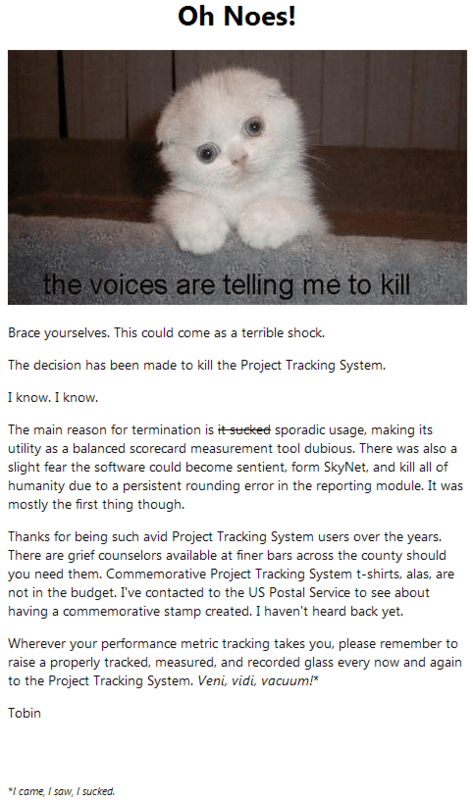 RIP Project Tracking System. Should have known you were goners when that house fell on your sister.